TROY, NY – The Collar City is nearing the completion of the community’s Comprehensive Plan, a guide for municipal decision-making, investment, development, and land use planning in Troy. 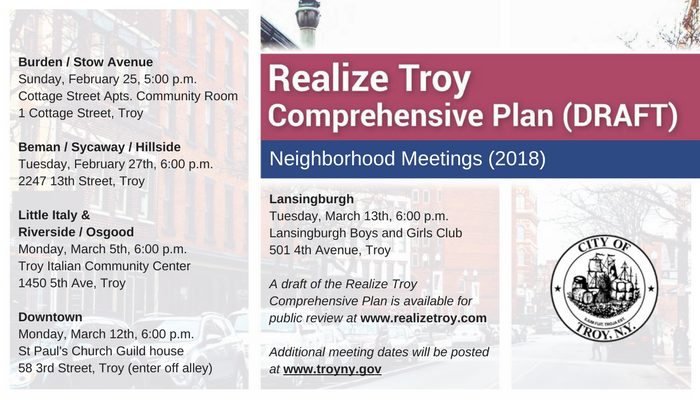 Today, Mayor Patrick Madden announced the City’s Planning Commission will conduct the first of two public hearings of the Realize Troy Comprehensive Plan – the City’s first in over 50 years – during the body’s upcoming meeting scheduled for 6:00pm, Wednesday, February 7 February 21. The Realize Troy Comprehensive Plan provides a framework to guide new development and transformation in the City over the next 25 years and beyond. The result of a three-year dialogue with the broad community aimed at determining community goals and aspirations, the plan seeks to guide positive change in the City of Troy through policies, actions and strategies that address contemporary issues and opportunities to create a healthier, more prosperous and sustainable city. The City of Troy’s previous Comprehensive Plan was completed in 1962 and was the first planning and policy document to guide growth and development in the community. 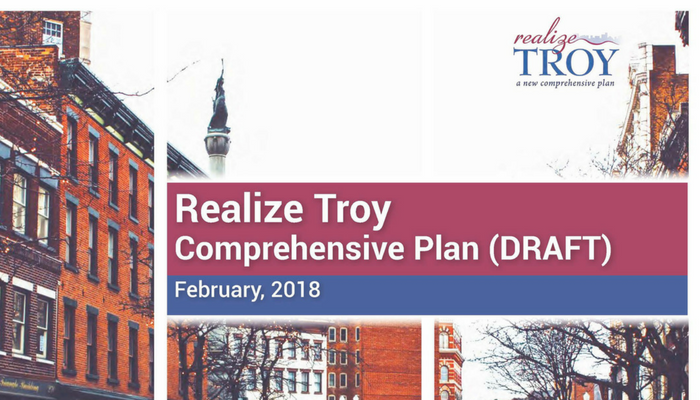 A draft of the Realize Troy Comprehensive Plan is available for public review at www.realizetroy.com. The City’s Planning Commission will hold a second hearing in March in order to provide residents and community stakeholders an opportunity to review the document and make comments. After review, the Planning Commission will make recommendations to the City Council. The City Council will hold a final public hearing with plans to adopt the Comprehensive Plan on Thursday, April 5.